Claim settlement is managed investigation and compliance of request for short materials received by customers of supplied materials. Claim settlement is the process that conducted and managed on request of customers of received shipment, materials which had ordered for its end applications or any other requirements have received with short quantity, and against the received short quantity customers are claim the materials received in short quantity as ordered, claim settlement process is conducting all application received from customers for the settlement of each ordered received from customers and comply on completion of investigation sure that the materials really received in short quantity by customers. 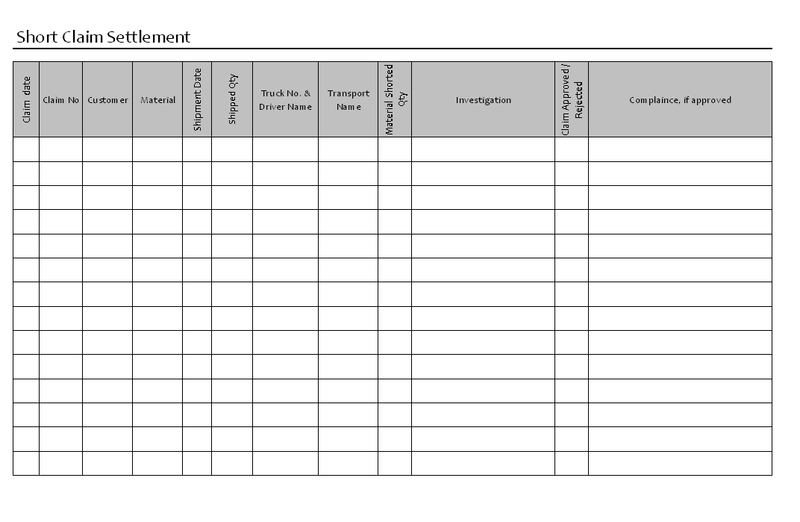 Claim settlement processes are for short materials which are delivered to customers, the product sold to customer and shipped through any transport are managed and recorded in format to identify and investigate reasons of short materials, the materials which delivered and identified short are managed and provided remain materials to customer accordingly. Short materials claim settlement is conducted by marketing department, and marketing department is received the claim & corresponding with customers as communicate with internal departments and status update to customers. Short claim settlement format is used to recording information of claims from customer on received short materials against ordered, the records are maintained by dispatch department and dispatch manager is responsible for managing records and concern activities, and also for the monitoring, controls and investigation of whole process. the format describe concern details of shipment where shipping details, transporter details and shipped materials against order quantity. The records are managed for reducing errors and mistakes and settlement of short materials.